Get 3 treaments for just $2100.00! We recommend a minimum of 2 treatments for best results. More treatments yield even better results. Lose up to 3 Inches with 3 Treatments. 90% Real Self Rating. Works Great on Your Stubborn Belly Fat (pooch). No Hot or Cold (unlike other fat reduction procedures). Offer expires August 1, 2016. Offer doesn't include taxes. Discount may be subject to change. Discount may be modified or withdrawn without prior notice. Offer cannot be combined with any other discount. No refunds or cancellations. Based on scheduling availability. Certain restrictions apply. Limited time offer. Offer only valid after consultation and medical clearance. 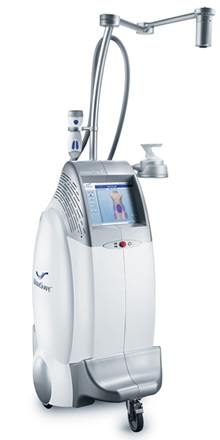 Discounts are based on a single area to Ultrashape. UltraShape is an advanced non surgical liposuction system that breaks down unwanted fat without surgery. UltraShape uses pulsed ultrasound waves focused on pockets of fat that are shaken to the point where they collapse. The fat cells are cavitated, dissolved and eventually processed by the bodies liver. The treatment uses neither extreme heat or cold. Permanent fat loss with no downtime, no pain and no bruising. There is NO DOWNTIME	with the UltraShape. You can have the treatment on your lunch hour and return to work without any discomfort at all. Results are as permanent as traditional liposuction and can be seen after as little as 2 weeks. The focused energy is perfectly even so there are no lumps or uneven pockets of fat which can be a problem with traditional liposuction. The UltraShape is ideal for patients who are not obese but have pockets of fat they are having difficulty getting rid of through exercise or dieting. The treatment works best to reduce extra fat around the thighs, waist or love handle areas. The UltraShape has been clinically proven to work, safe and effective and has no adverse side effects. To learn more about UltraShape or schedule a treatment call Infinity Life Center at 808-945-5433. Clinically proven ultrasound treatments provide permanent non surgical fat loss. Perectly even distribution of fat reduction. Pain free walk in & walk out treatment. High patient satisfaction with no risks or adverse affects.